The multi-function car seat has always been popular on the market. 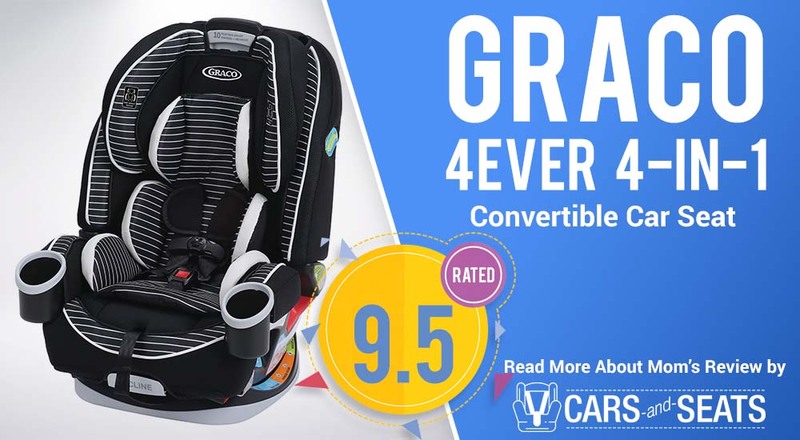 Graco 4Ever is one of the best brands when it comes to convertible car seats – and their 4-in-1 convertible car seat is being used by thousands of customers around the globe. So, what are some of the best features making this car seat great for toddlers, young children and kids in need of a booster chair? As you can see, the features above show that the chair is practically one of the most universal car seats in 2018. You can choose among the different colors including black, pink, blue, white, red/white, green/gray, black/gray, pink/gray and other finishes. Every color is unique on its own and can easily complement your car’s interior. As the manufacturer says, the Graco 4Ever 4-in-1 car seat gives you full 10 years of use from 4 to 120 pounds throughout all of the (rear-facing, forward-facing and booster) seat options. 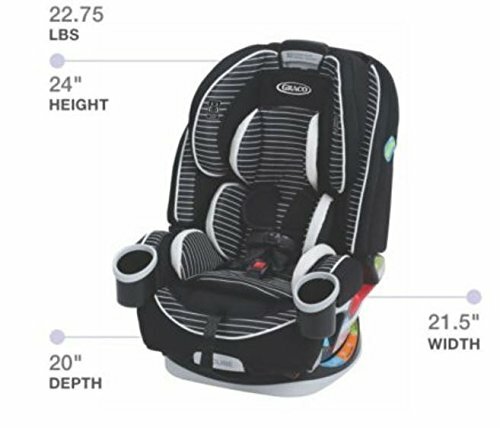 How To Install The Graco 4Ever 4-in-1 Car Seat To Your Vehicle? 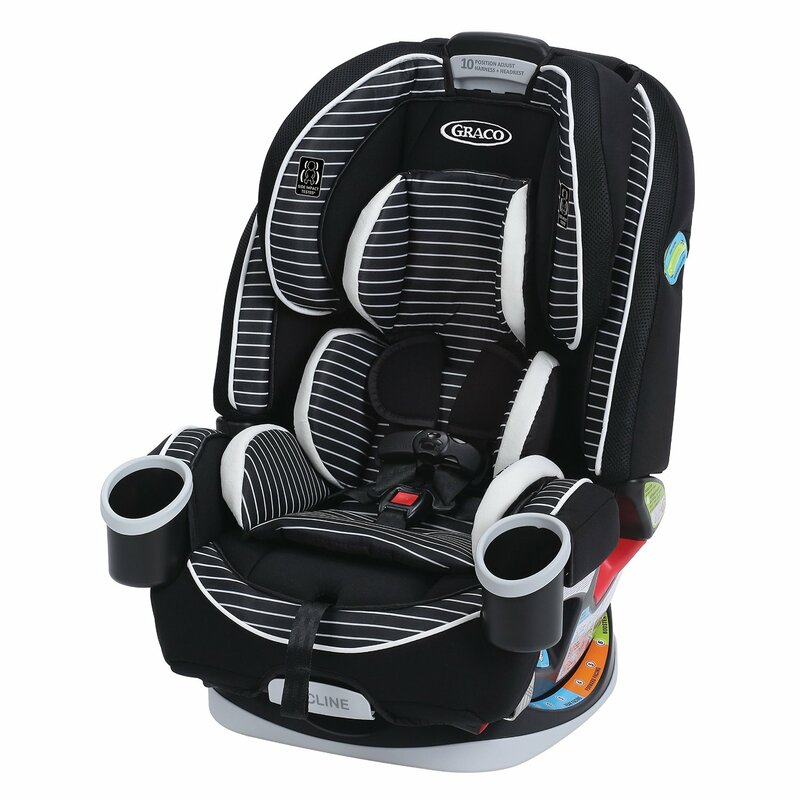 The Graco 4Ever 4-in-1 seat is generally very simple to install in practically every vehicle. This is one of the things that makes it versatile and reliable – but also a feature that gives you freedom to install, uninstall and move it from one car to another. 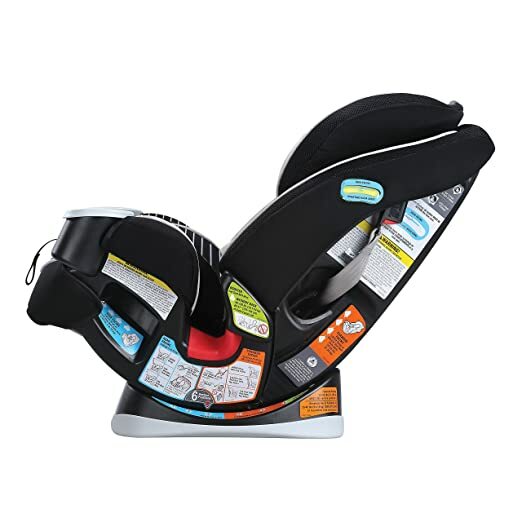 From the forward-facing to the back-facing modes, the car seat is easy to install and the belt paths are clearly labeled and even color-coded in the manual and on the seat. What you need to follow is blue color for rear-facing, orange color for forward-facing and green for booster positions. Additionally, the LATCH and tether straps are practical and easy to be loosen. This doesn’t compromise their security and gives you a firm grip. If you need detailed description and drawing of the hook style, you can check the detailed instructions (that you will receive with the package). What’s great about the LATCH straps in the Graco 4Ever 4-in-1 car seat is the fact that unlike many of the other Graco car seats, this model has only one LATCH which can be manually switched between modes. This makes the installation process easy. However, some customers say that the model could be designed with two separate latch straps as well. As you can see from the video above, the seat lacks a built-in lockoff device which is another con. This is why it is very important to understand how the seatbelt locks in your vehicle – if you are about to install the 4Ever seat belt without the LATCH anchors. Once your child reaches 42 lbs., it is recommended to use the lower LATCH anchors and switch to the seat belt installation. Generally speaking, all of the vehicles made after 1996 have seat belts that lock in some way and are able to hold a car seat firmly and in place during your driving. Nowadays, almost every vehicle has switchable retractors but there are vehicles which have specific seating positions too – with locking latch plates. This is why you should see the vehicle’s owners manual and get the best information on how to install a car seat in your vehicle using the seatbelt. When it comes to the structure used in the Graco 4Ever car seat, there is a steel-reinforced frame and energy-absorbing padding to protect your child in a crash. This gives the seat extra security and prevents your infant’s head from falling forward whenever they are dozed off. Once they outgrow the insert, removing the seat is a snap. The car’s padding is soft and squishy which results in a comfy ride. Moreover, the fabric is quite breathable which will help your child while preventing them from getting really sweaty. The 4Ever is also a car seat that features six different recline positions which is great. Each recline is adjusted by pulling the adjuster on the front of the seat. This gives your kid the comfort they need but also let you maneuver with the recline range according to your car’s back seats position. If you have a bigger vehicle or a SUV, the back-facing position of the Graco 4Ever 4-in-1 car seat gives you a lot of extra space. Forward-facing, you can use the recline between the positions 4 to 6. In smaller cars, the rear visibility may be blocked in some way – but generally there shouldn’t be many problems. The good thing is that the Graco car seat does not allow any overhang of the booster seat which creates problems with shallow vehicle seats. The LATCH use is permitted in high-back booster mode and the seat in general has a base that is nice and flat – which means that you shouldn’t worry about strange bumps on sharp edges that are poking into your car’s upholstery. All in all, the Graco 4Ever 4-in-1 car seat is easy to use. One of the best features is the fact that you don’t need to remove any of the hardness to use the seat in booster mode. All you need to do is tuck it out of the way in the shell. The cover can be removed very easily. It comes off nicely in three parts using some tabs and elastic loops and hooks. Getting the cover back, on the other hand, is a tad tricker because you need to remember exactly where the elastic loops hook. However, the fact that the cover can be removed gives you comfort and convenience when it comes to machine-washing or rinsing the cover in the gentle cycles. Unbuckling the chest clip in this seat definitely needs some strength which is good if your kid is a little escape artist. All you need is to lift the lever and pull on the straps to loosen or pull the strap under the level to tighten the harness length for a secure fit. Below, we are summing up the main advantages and disadvantages of the Graco 4Ever 4-in-1 car seat. 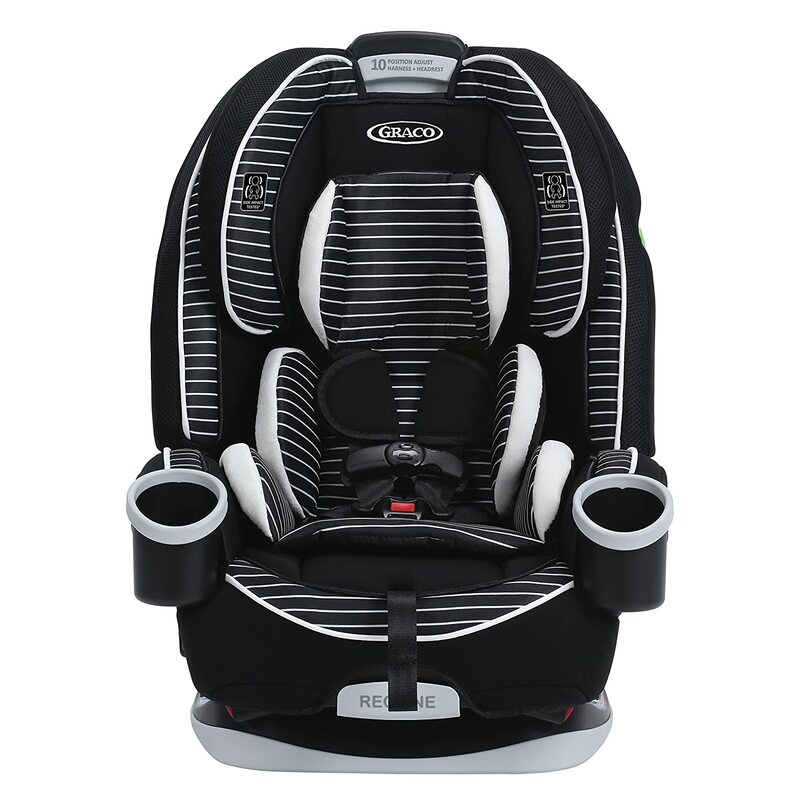 Most of the parent testers have given this car seat a great rating when it comes to easy of use and reliability. The overall quality and value for money is also above average. And while the majority of people say that this is one of the best car seats in 2018, there are still some flaws (as listed above) which can serve as pointers for the brand to improve. The user-friendly and color-coded manual, plush padding and breathable fabric give some of the extra points to this seat. So in a nutshell, the Graco 4Ever 4-In-1 Convertible Car Seat has a lot to offer and it definitely deserves a place among the best car seats nowadays. As our last note, we always recommend trying the car seat before buying. This way, you will always make the best decision!